Big value, racing excitement and fun stunts are in store with these two cool sets. 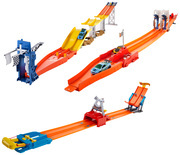 Each features dynamic, huge tracks that measure over two feet long and connects to the Super Loop Chase Race Track Set for expansive, floor to wall to floor racing action! The assortment includes the Super Start Jump Race set, which offers classic side-by-side racing with two daring downhill jumps to tackle. Connect to the Super Loop Chase Race track setand the winner will race on for continuous action while the loser gets tossed off the track! The Super Launch Speed Track offers classic side-by-side racing and a double booster that gives cars an extra kick to the finish line. Connect to the end of Super Loop Chase Race for a super fast race to the finish line! Each comes with one 1:64 scale vehicle with brilliant styling, innovative design and deco. Ages 4 and older.